Discussion in 'Gigabyte and Aorus' started by BringTheRain403, May 8, 2017. No Worries, I had lightly explained it earlier but hadn't linked that email, I'm having to return the laptop on my dime for shipping to get my money back. Just received green UK version. It seem to have NVME drive installed which is good. Noticed a couple of hw issues. First is very minor, webcam lens seems s bit misaligned relatively to the hole in the laptop chassis. Thankfully that doesn't influence the image, video corners are not cut. Second issue is a bit more noticeable - its a relatively large white spot near the left bottom edge of the screen. It seems to be a common issue due to thin bezel-less design? Also there is a software issue with Fn+Esc button, which supposed to enable-disable "maximum fan" mode. I noticed that if you run in silent mode (fans off) and double press Fn+Esc (enable and disable max-fan mode) the fans will continue to operate at 30% at low temperatures, instead of switching off. This then can be fixed only by switching modes in SmartManager, for example after silent->gaming->silent fans are off again. Is there a way to program some button to cycle through different fan modes? Something's of note device is running Win10 LTSB unverifed atm (working on getting my KMS to activate) so that's why the windows activation is in the bottom. If this is what's causing my issue then idk where to start :S Let me know your thoughts! Yea, the unit I received was beyond atrocious when it came to bleed as it was visible even in broad daylight. I returned the device on Monday last week, it was received Wednesday and I'm waiting on them to get back to me on my refund. We shall see what they do. But with that said, I think the panels used have a tendency to bleed with the way they're produced. The UX550 models that got shipped out carry the same panel and roughly the same build and exhibit the same problems. Just wanted to put my 2 pence worth in. So I got the laptop initial thoughts…beautiful looking hardware, the aluminium part feels great and the plastic even though wished it was aluminium feels premium. in this laptop to do the same thing as you (plug it into a gaming box via thunderbolt 3). I guess I might take a risk in msi gs63vr or wait for the coffelake and volta-equipped machines. For the record, the French version of the Aero 15 (B40W10P-FR) can be shipped at least with 2 different SSDs: Liteon CV1-8B512 or Transcend TS512GMTS800, none of which are NVMe. Since you're using a French keyboard, do you have the same keyboard issues (when fully updated) than everyone else ? 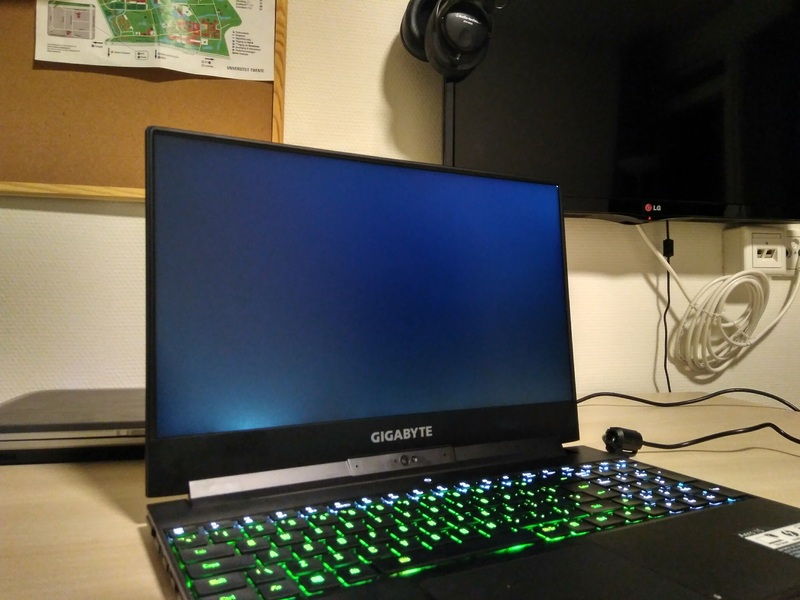 I just got a Gigabyte Aero 15 today. I believe the fan's noise is not what it's supposed to be, it makes a weird noise while operating. I've uploaded a 10 second recording of it. Can anyone confirm whether it's supposed to make it? Uh that definitely does not sound normal. The fan is probably rubbing against the casing. Can every owner in this thread PLEASE download HWINFO and navigate to PCI Bus Port 5, as seen in my screenshot below. This is to check for the Thunderbolt 3 speeds. 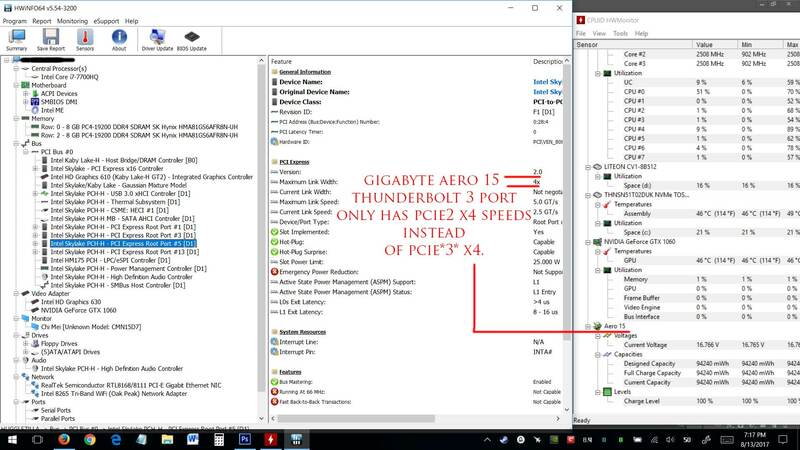 This is an issue that seems to be affecting many Aero 15's. You may not have full Thunderbolt 3 speeds *that you paid for*. It will literally only take 5 minutes to do. 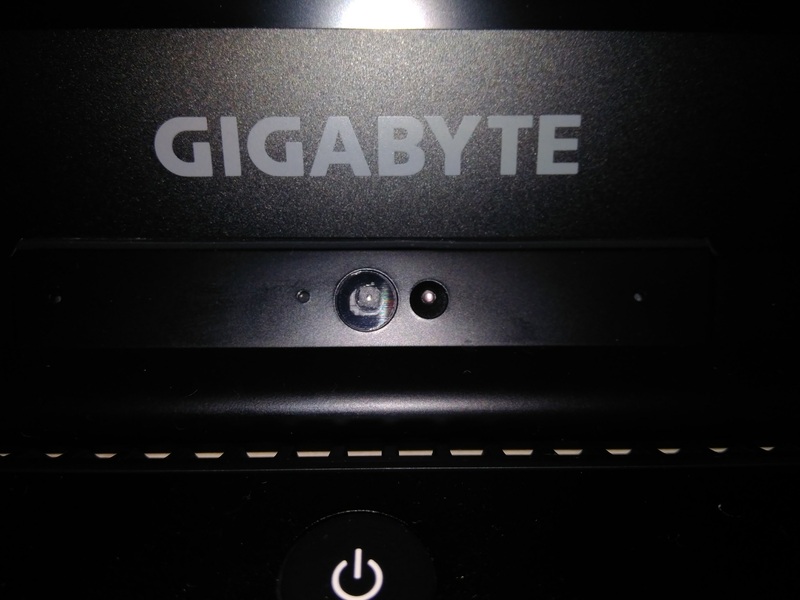 Please take a screenshot and upload it so we can notify Gigabyte. Refer to my screenshot below of where to look. Note that on the left, I have selected Root Port #5 under the PCI Bus heading. Note on the right under the red highlights, it says PCIE version 2 and speed x4, which is not the advertised PCIE version *3* x4 that we paid for. Linked to imgur and also attached.